Gourmet Irish-themed buffet available 5-7 p.m. Happy Hour entertainment by Zach Shelly 5-9:30 p.m.
Irish dancers live at 7:30 and 9:50 p.m. Featured Irish drink speicals and fish-n-chips special all night. Plus, guests can collect gold coins throughout the night to drop in the Pot O' Gold for a chance to win at 11:30 p.m. For each featured drink, guests receive one gold coin; for fish-n-chips purchase, guests receive two gold coins. 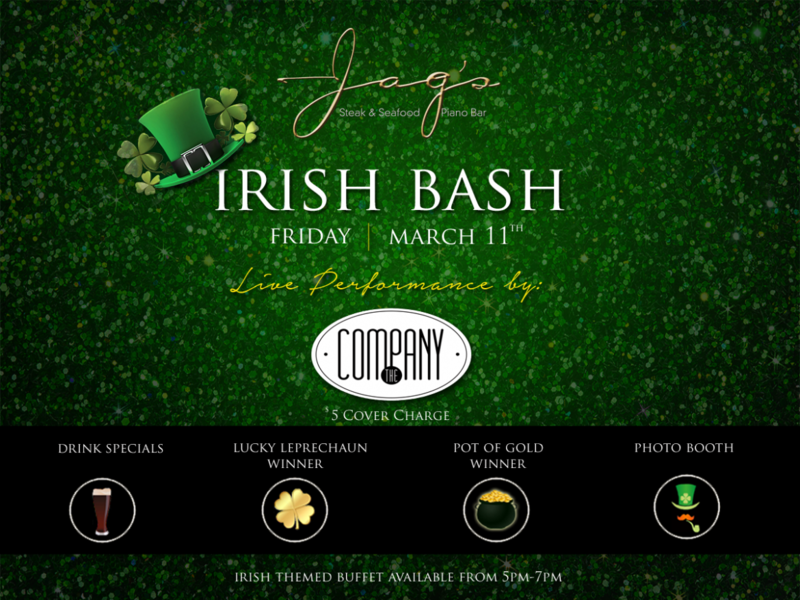 Prizes in the Pot O' Gold include a $50 Jag's gift card and four free entry passes for premium live entertainment on the weekends. Piano Bar guests will also receive a ticket for a chance to be a Lucky Leprechaun winner. We'll be calling winners 6-11 p.m. to receive a $10 Jag's gift card that can be used that evening. A themed photo booth will also be available all night. Use our Irish-themed props and snap your own photo, then share it on Facebook and Instagram with the hashtag #jagsirishbash for a chance to win another prize! We hope to see you March 11 for a fun-filled evening at our inagural Irish Bash!